Magician and dancer Ozzie Leyva. 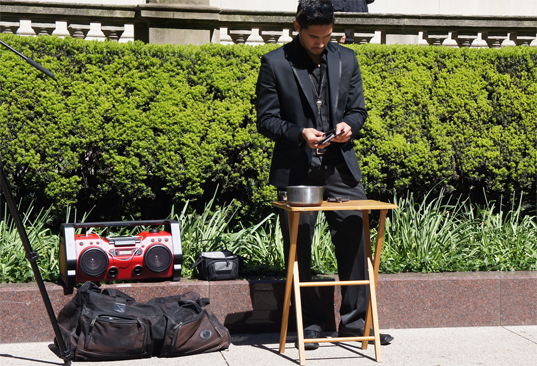 He says he makes $80-$100 on a good day doing magic in downtown Chicago. Kaliq Woods, musician. 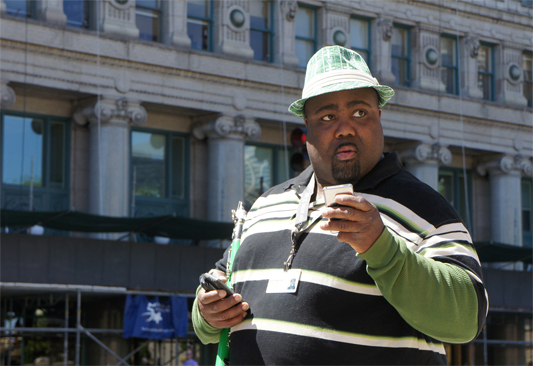 He can make up to $100 playing on Michigan Avenue, but he says for him street performance is not about the money. Too bad we couldn’t reach Melissa; we wanted to know what sparked her curiosity in the first place, and whether she had any leads to consider. Regardless, we hit up experts for some estimates, and then we hit the streets to interview a panhandler and two street performers about their wages. Ultimately, the estimates line up pretty well with the responses we got on the streets. Scientific? No. Revealing? Yes, especially when you consider that we were warned that street musicians in particular might not want to tell us their wages. Also, each person has a lot to say about whether they need the money, people’s expectations when they give money, and they even have a few thoughts about each other. Christian Perez is a 33-year-old man who panhandles at the corner of Ogden and Western Avenues on Chicago’s Southwest Side. Perez panhandles for about nine hours per day and says he makes about $60 each time. If he did this every day of the year, he’d make around $22,000. Jim Lobianco, the executive director of Streetwise, a group that works with former panhandlers and offers them a job selling magazines, says some panhandlers can make up to $100 or $200 dollars per day if they are located in areas with high pedestrian traffic. But, he says, it’s unlikely that they’re doing that every day, year round. Street performers’ hourly income seems to vary. Gabe Chapman, who founded a street musicians’ support organization called Chicago Street Musicians, estimates that during a rush musicians can make $30-$40 per hour; during a slow hour, he says, it’s more like $10. Most musicians don’t work 8-hour days. Based on a presumed five hours of playing, the averages provided by the performers we talked to line right up with Chapman’s estimates: Magician Ozzie Leyva says he averages $80-$100 a day, and though musician Kaliq Woods was hesitant to give a number, told us (after being pressed) that $100 was a fair estimate for a day’s work. Performers also deal with related costs; for example, they must pay the city $100 for a permit that lasts two years. And Woods says he spends $15 or so per shift on a cab, and he also pays for reeds, new instruments and batteries for a portable amp. On the flip side, street performing isn’t his only job; he also tours and records with several bands. And as you see in the video, Woods insists that he’s not in it for the money anyway. One commonality between the two is problems with police. Woods complained about being pushed off corners by new regulations and noise prohibitions. Panhandlers are also subject to a set of laws about where and how they can ask for money. A key difference between the two lifestyles is stability. Most street musicians see what they do as a profession to take pride in; panhandling is often accompanied by instability. While panhandlers can potentially make more on a given day, both people on the street and the experts we talked say panhandling is a more challenging lifestyle. Lewis Wallace and Adriana Cardona are Pritzker Journalism Fellows at WBEZ. Follow Lewis @lewispants and Adriana @nanisc99.